Can you believe it is almost the end of October! Sheesh, where does the time go? I had grand plans for my Halloween crafting, and it just hasn't happened - oh well, most of it should translate into general fall crafting! But, maybe I better just get started on Christmas!! This was a super quick card - I love these no-layer cuties! 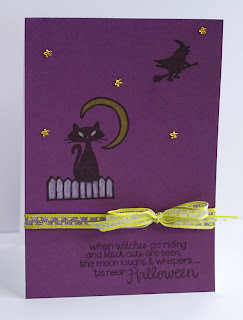 The fence and the moon were colored with colored pencils, throw on a couple stars and a ribbon and you are d-o-n-e! We are planning on going to a friend's house for Halloween this year - have a little party, eat some yummies. One drawback to living in the "country" - not so easy to trick or treat!! I am fixing "bloody carcass" (AKA barbeque brisket) and string cheese fingers!! Hope you all have a very happy Halloween! Etc: A Muse Blackberry notes, star twinkle stickers, Lime green sheer polka dot ribbon. It's a bird, it's a plane, it's a pirate hat - no, actually it is a corner bookmark! 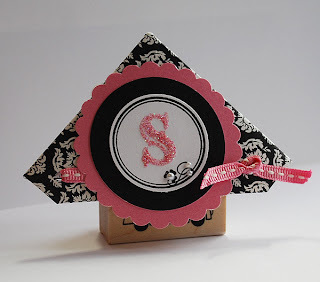 I had seen this idea floating around blog-land, and I decided to try it with the awesome new Shimmer Couture paper from A Muse! It was super easy - just a little bit of folding, made easier with the Scor-Pal. I followed the tutorial here, but I adjusted the size a bit to fit a large square scrap of the Onyx Damask Paper that I had! My square was 5 3/4". I made the pretty monogram using the beee-u-ti-ful new Fancy Alphabet, and the Monogram Frame set. The black and pink are actually the Shimmer Pink and Onyx, but I have not perfected getting a good pic of the shimmer!! I accented the frame with the white pearls! Love them! This will be making it's way to one of my besties as a gift of gratitude for lending me her copy Breaking Dawn. I've had it for an embarrassingly long time! Hello!! 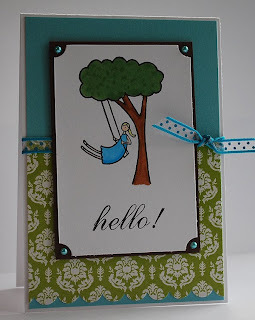 Just a very simple card to show off more of the amazing new stamps and papers coming soon from A Muse! On this card, I used 2 new colors of the Shimmer Couture paper, new Robin's Egg Blue sheer polka-dot ribbon, and new Robin's Egg Blue pearls! These pearls are causing me some serious crafting dilemmas! Twinkles or Pearls, twinkles or pearls??? What's a girl to do? Make sure that you check out the other A Muse gals for more inspiration! These stamps and papers could be in your local stamp stores now!! Happy Fall!! A Muse is once again preparing to *wow* you with the latest release! This one is really just full of amazingness!! I am always amazed at how the A Muse stamps work together and play off of each other! 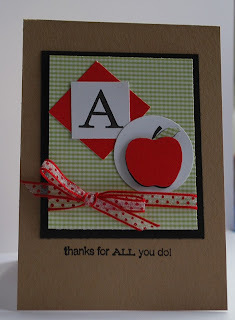 The new on this card (A from the Classic Alphabet Clear set, and the Apple shimmer paper) just looks like it was made to go with the sentiment and the apple from the Back to School release! Those A Muse gals, evil geniuses, I tell ya! Make sure to check in with all the A Muse gals for more amuse-bouches - one is never enough!